It’s hard to have much sympathy for budding horror comic book artist Whitney when she enrolls in an art institute which looks like its located in the cabin from The Evil Dead. But then again, maybe I’m being too hard on her because how could she have known that reading the incantations in the ancient book she finds there would help summon a monster? Okay, so maybe it was The Evil Dead house after all! Surely though, having Lily Munster herself Yvonne DeCarlo as Mrs. Briggs, the bitter director of the art colony, is a total upgrade from Bruce Campbell fighting deadites especially since she’s so much more evil than anything Ash ever faced! Because she craps all over comic books as a legitimate artform! Come on Mrs. Briggs! What about seminal works of the era such as Watchmen, Cerebus, and American Flagg? 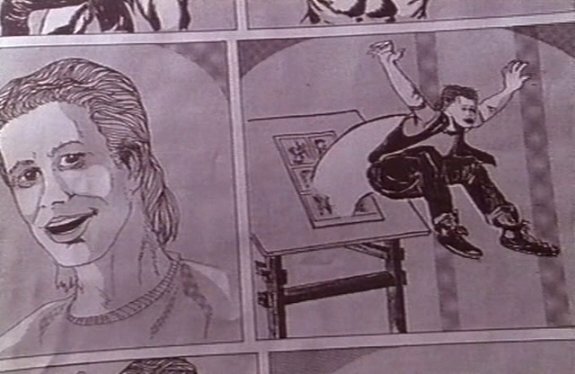 Just because Whitney’s artistic skills look less like Al Feldstein and Johnny Craig and more like something some small press outfit like Blackthorne, Eternity Comics or Solson would have published during the B&W explosion of the 1980s doesn’t mean the whole medium is amateurish trash! Mrs. Briggs though may not be the best judge of artistic talent though what with the finger painting angst of Phillip or the absurd performance art of Lisa being featured so prominently at the institute. Truth be told, the Throckmorton Institute for the Arts is probably not be the most prestigious artistic school around since it is housed in the same place where comic book artist Colin Childress and a woman were killed 30 years before, with the official story being that Childress murdered her. Of course as anyone who’s ever read a bad horror comic knows, it was really his drawing come to life (with an assist from the ancient book) that really did the dirty deed to her. Much of the story’s set up didn’t really seem to add up. Mrs. Brigg’s instant antipathy toward Whitney as well as her claim that her superiors forced her to let Whitney enroll never was satisfactorily explained and didn’t have any bearing on the plot beyond Mrs. Briggs scheming with another student (Amanda) to get Whitney kicked out for plagiarizing. I also never quite figured out how the basement studio Whitney worked in could have been whipped into shape merely by dusting some cobwebs off and having Phillip touch up the giant EC Comics-inspired painting when the whole thing had been burned 30 years before when it was Childress’ studio. And the less said about the former private investigator turned author who liked to act out scenes from his stories by holding a gun to Lisa’s head and firing a live round inside the house, the better. As is to be expected, the monster part of all of this is treated with equal stupidity. Whitney draws scenes of Amanda getting killed by the monster and also read a passage from the book, not knowing the combination would bring her work to life. It kills Amanda and eventually just about everyone else even though she didn’t draw any of that. Sadly, where those pages came from was never explained, thus depriving us of the one scene that could have made this movie a classic – the monster hunched over his drawing board furiously penciling the pages and desperately trying to make his deadline! After accidentally spilling white out on some of her pages, the monster disappears and then she gets the idea to draw the people it killed so that they would come back to life and also to draw the monster being captured. However, Instead of just drawing the monster dying or giving up or turning into a friendly unicorn, she suddenly determines that Childress defeated the monster all those years ago by burning it alive! Debrah Farentino as Whitney certainly doesn’t impress here as her conversations with Mrs. Briggs and especially her enemy Amanda are terribly stilted. Frankly, she and everyone else are off-putting in how unconvincing they all are though that may be due to Don Mancini’s wooden script. Farentino would go on to have a lengthy career in TV, Mancini created the Child’s Play franchise after this and Brian Robbins (Phillip) starred in Head of the Class and then became a producer (Smallville) and director (Varsity Blues) so maybe Cellar Dweller is just a bunch of talented folks getting their feet wet with the expected rookie results and missteps. 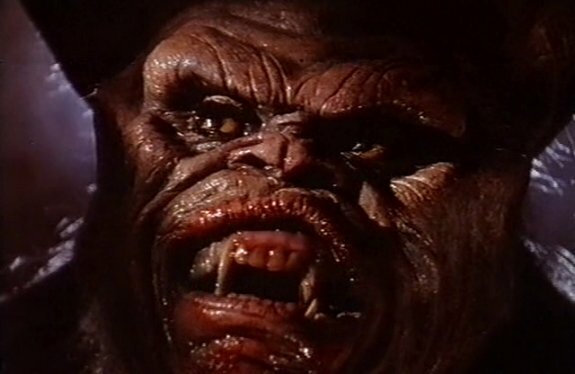 Special effects whiz John Carl Buechler directed and also worked on the effects here and certainly wanted to show off his monster. We see plenty of it, including close ups of its face munching on body parts and this evokes more chuckles than anything else. Certainly less would have been more here in order to make to make the monster something the audience can take seriously, though I’m not sure how much of this was supposed to be scary in the first place (at one point a banana peel is drawn in a comic panel and appears on the floor for Amanda to slip on while being pursued by the monster). Ultimately, the movie’s biggest failures are the muddled business with the monster’s abilities/limitations and just as importantly, that it never strikes any sort of consistent tone, the attempts at humor fall flat and the horror parts have no impact since the characters were never treated seriously.